Oh yea, the ONE Fighting Championship will be back in KL next month! The explosive, entertaining and ever-aggressive Rob Lisita will face 9-0 Russian debutant Marat Gafurov in the main event. 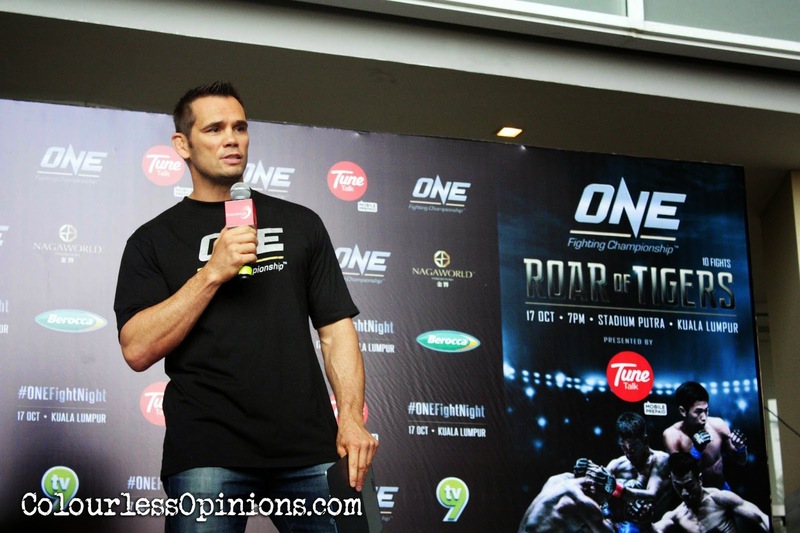 MMA legend and former UFC Middleweight Champion, now Vice President of the ONE FC, Rich Franklin was present at the ONE FC Media Workout Session head in Paradigm Mall recently to officially announce that ONE FC: Roar of Tigers is set to be held on 17th of October at Stadium Putra, Kuala Lumpur, Malaysia. Rob Lisita (14-6) is eager to come back from his loss to Eric Kelly to prove that he’s the best featherweight fighter in the ONE FC and face the newly crowned champion Narantungalag Jadamba. Marat Gafurov was the reigning M-1 Global Featherweight Champion before joining the ONE FC and has a vicious ground and pound that got him six finishes thus far. Eric Kelly’s younger brother, Edward Kelly (5-1), who suffered a loss in his ONE FC debut in the undercard of ONE FC 13 Moment of Truth, will be in the co-main event (straight from losing in the undercard, wow…) against Malaysian fighter Ev Ting (7-2), who’ve won in his ONE FC debut. Local fighter Raymond Tan (2-2) of Penang Top Team, and Singapore’s Stephen Langdown (1-1) will both face each to get back onto the winners bracket. There won’t be a title bout and I’d assume that the injured Malaysian welterweight title contender Adam Kayoom still won’t be back yet as both the main event and co-main event have already been announced. However, Malaysia’s other best representatives, Peter Davis, Gianni Subba and Saiful Merican, will most likely be on the card as well along with local female kickboxing champion Ella Tang. These four local Malaysian fighters were also at the mall last weekend to give the public a demonstration of some takedown, grappling, striking and defensive moves. Local superstar, Peter Davis (8-3), is on a 2-win streak while our top Muay Thai fighter, Saiful Merican (3-1), has been unbeaten since his second MMA career so these two should expect a tougher challenge this time. Malaysia’s young prospect 21-year-old Gianni Subba (4-1) will look to start a new streak after winning his last fight whereas Ella Tang still seeks for her first MMA career win after suffering defeat via decision at ONE FC 17: Era of Champions. Who’s Peter, Saiful, Gianni and Ella will be facing? Who else will be fighting? We all wait eagerly for the reveal of the rest of the fight card. Stay tuned to my social channels below for updates. Tickets can be purchased on AirAsiaRedTix.com with 30% discount until tomorrow (10 Sept.). Fans around Asia can catch it live on Fox Sports / STAR Sports or via online live streaming on ONEFC.livesport.tv at US$9.99. The ONE Fighting Championship is powered by Tune Talk.